Sizing can be a little tricky especially if you are trying to decide whether you want a ready made corset, made to measure or fully custom. 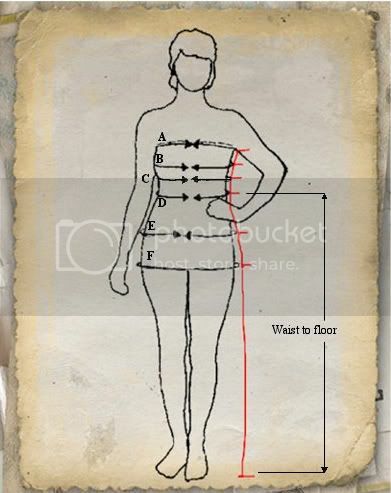 Here I am including a size chart with UK, USA and European dress sizes and corset sizes along with two diagrams to help you take your measurements. There are no official, set industry standard measurement charts so they all have to be taken as a guide and most clothing manufacturers will have their own ideas on their size charts but I have taken the most commonly used measurements for this chart.